Ready to set the scene ablaze, Oscillate is a unique concept in association with Wild City circling around the promotion of future-facing artists as well as high quality sound systems. 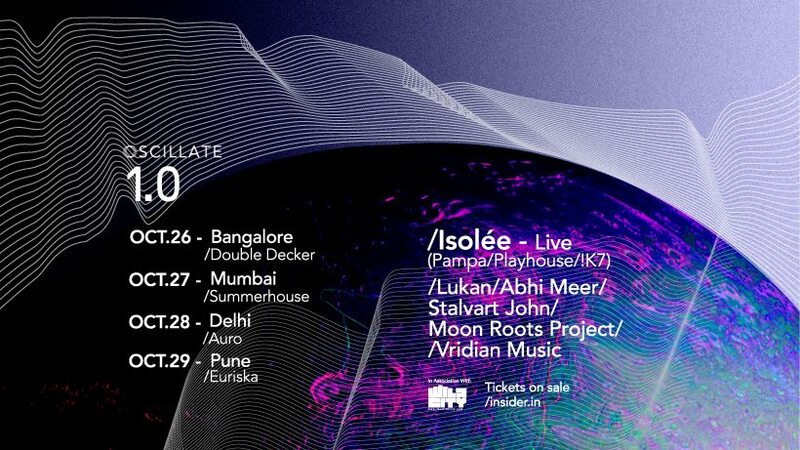 Planning on having monthly instalments, the movement begins with Isolee – an electronic music craftsman from Germany, spreading the musical magic to Delhi, Pune, Bangalore and Mumbai. Creators Nakul Mehan and Kunal Seth have envisioned this to specifically shake up the stagnant Indian electronic music scene. “Oscillate for us is a practical and achievable translation of our own personal clubbing experiences in London, Berlin and Ibiza,” say Nakul and Kunal. “We are sure that there is a multitude of like- minded people in the country who share the same vision or want to have similar experiences. Through Oscillate, we hope to cater to them and together create memorable experiences,” they add. By introducing an immersive aural-visual show, Oscillate wants to pull together all like minded people, looking for something different, something along the lines of Dekmantel, Hydra and Elrow. For its first edition, revered German producer Raijko Mueller AKA Isolée to play a four city tour. Isolée, considered to be a pioneer of the lush, emotive house sound, has put out music on labels like Diynamic, Mule and Dial, and is now a mainstay on DJ Koze’s high flying Pampa Records. Giving Isolée company across all four cities will be Oscillate co- founder, DJ and producer Lukan, who will be playing vinyl only sets. Also, our very own Stalvart John will be playing along side him and as well as Mumbai-based selector Abhi Meer. Supporting them will be the fresh talents of VridianMusic and Moon Roots Project. The early bird ticket is Rs 300 and at the door Rs 400 before 11pm and Rs 600 post that. Here are some deets about the gigs in different cities!